Forbes has released this year’s list of the world’s 10 highest paid actresses, So who is on the list? Emma Stone, Oscar-winner for La La Land, is #1 for the first time, with Forbes reporting earnings of $26 million. Jennifer Lawrence, who topped the list two years in a row, has slipped to third place, behind Jennifer Aniston. The Jennifers are at $25.5 and $24 million respectively – JLaw made just half of her 2016 total. The top three on the list of 10 are the only actresses to have made over $20 million. They are followed by Melissa McCarthy, Mila Kunis, Emma Watson, Charlize Theron, Cate Blanchett, Julia Roberts and Amy Adams. Forbes reports a 16% drop in the cumulative earnings of the world’s top actresses – $172.5 million this year, down from $205 million in 2016. 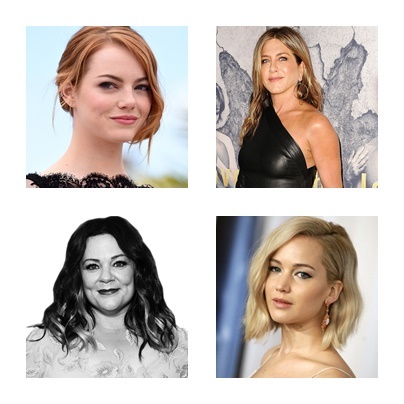 Forbes also notes that half the actresses on the list are over 40 – Jennifer Aniston, Melissa McCarthy, Charlize Theron, Cate Blanchett, Julia Roberts and Amy Adams – a significant achievement given the scarcity of roles for women their age. Forbes also flags another ugly truth – only 28.7% of speaking roles in films are filled by women.